Once you've decided that you want to become a certified and trained Eyelash Technician, taking the next step is hard! It seems like there are so many options out there when it comes to selecting the Lash Program that is the best! It can be overwhelming when comparing all of the programs but here are a few things to look at when you're deciding. Here at FIXE we are so proud of the QUALITY that we provide to all of our students. From our comprehensive manuals that are always being updated to stay current with our ever changing industry, our incredible mentorship and on-going support, fully stocked starter packs, and affordable tuition we are proud to say that we are UNMATCHED in Canada with the quality of training we provide. What regulations and guidelines does your program follow? Unfortunately the Eyelash Extension Industry is NOT regulated in Canada and also many states in the US. This is the reason that you see so many people teaching lashes. Doing your homework and selecting a certified, accredited and licensed program is so important when you're deciding where to invest your hard earn tuition dollars. There is a program in Canada called National Alliance of Lash Artists (NALA) and they follow the Canadian Accreditation Regulations when it comes to providing guidelines for educational programs. Training courses in Canada that are accredited by NALA have a strict protocol to follow and are held to the absolute highest standards and are the most recognized in our country and globally. Make sure to ask which accreditations the education program has. Other bonuses are to check out if they are a part of the Better Business Bureau and if they are licensed and insured. If you are paying someone to teach you how to run a proper business, the teachers themselves better be running their business perfectly. What is the student to teacher ratio? Contact the School themselves if it is not mentioned on the course description. In accordance with NALA and Canadian Accreditation Regulations there should never be more than 6 students for one instructor. Any more than that and the safety of your models and also the quality of your training is jeopardized. How many hours of IN PERSON instruction does your course entail? Make sure that you ask how many days that your course is and how many hours of theory are included. So many people are shocked to learn how much theory goes into lashing and it is not something that can be taught in a couple hours. Safety and Hygiene alone can take up to 3 hours to teach properly. How Many hours of SUPERVISED live model application do you get? There are so many different things that can arise with live models/clients and supervised LIVE model experience is so important so that you can leave your program feeling confident and knowing that your clients are in the best hands. NALA regulations require 8 + hours of supervised live model application. What support do I have once I have completed my training? Learning lash extensions is not something that can be accomplished in just one or two days - so make sure to ask if the program includes online training and ongoing education and support with your teacher. This is so important. Do you have a place where I can review testimonials or call past students for references? Why not seek answers from unbiased people. Check out testimonials and reviews online and don't be afraid to ask for student references. People who excel at their trade are people who are trained by the absolute best in their field so don't be afraid to take the time to ask questions and to do your homework so you make sure you are off to the absolute best start in your lashing career!! We hope this helped you in making your decision! Welcome to the Exciting, Fulfilling and Rewarding industry of Eyelash Extensions! There’s no doubt Calgary is an amazing hotbed of entrepreneurial spirit coming out of the recession. Whether it’s fitness, art, food, or services, Calgarians are leading the way in offering up diverse business plans and strategies. To celebrate some of this diversity, we gathered the stories of five amazing women entrepreneurs in Calgary to find out how they got started. Jennifer Galloway’s Wymbin Yoga offers yoga programs for children with adapted needs. Photo courtesy of Kristy Anne Swart. Hundreds of youth around the city benefit from the classes, workshops, camps and other initiatives run through Jenna Galloway’s Wymbin Yoga and its sister non-profit, BEAM. But it wasn’t always Galloway’s plan to become an entrepreneur. In her third year of university Galloway made the difficult decision to drop out of school. During that time, she said she found comfort in practicing yoga, recalling how it was the one place she could stand and look herself in the mirror to escape her own thoughts and anxieties. 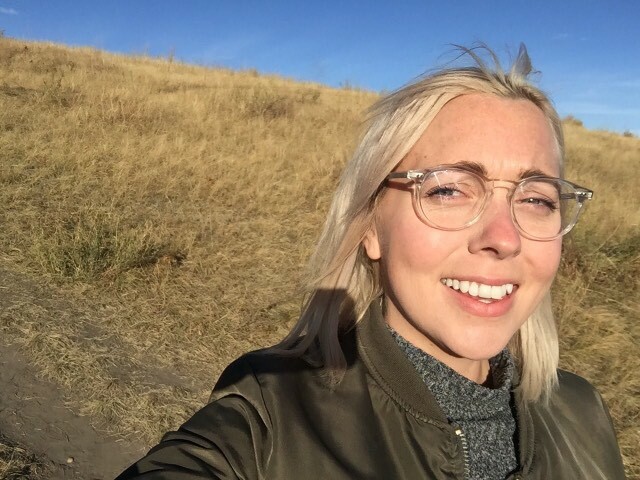 During her time in the Faculty of Medicine at the University of Calgary, Galloway was made aware of a lack of affordable, accessible holistic wellness programs for children with autism. Pulling from her own experiences, she began to think about how yoga could benefit children with adapted needs. Galloway put out a call for yoga mat donations to begin programs for youth with adapted needs. There was a huge outpouring of support. As interest in her program increased, her non-for-profit BEAM was born. Galloway opened the Wymbin Yoga studio in Inglewood in April 2017 with hopes to bring connection to the Calgary community. FACT: Wymbin is an Australian-Aboriginal word for “pink-eared duck.” Yes, that’s a real thing! Julia Kansas works with each exhibiting artist to create merchandise exclusive to Five Arts & Merchandise. Photo courtesy of Kaitlin Moerman. 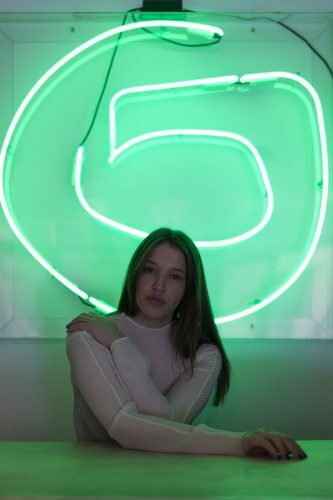 While interning at a gallery in Toronto, Julia Kansas found herself daydreaming about owning her own space. She dreamt of a space where she could flex her creativity while also providing people with the opportunity to engage with art. She didn’t set up shop in Toronto, though. Instead, she chose Calgary because she saw this dream space as something the Calgary community needed. After completing an accelerated business course and creating a business plan, it only took a few short months to find the perfect space for Five Arts & Merchandise in Calgary’s East Village. Kansas notes that entrepreneurship isn’t always easy, though. With a BFA in drawing from the Alberta College of Art + Design, she says it can be difficult to focus on exhibiting artists’ work while also creating her own. FACT: Kansas works with each exhibiting artist at Five Arts & Merchandise to produce a piece of limited edition merchandise. That means you can purchase something artist designed even if you don’t have the budget for an original piece of art. Jesse Penner made the move many people have only dreamt of when she chose to quit her corporate job and start her own business. Though the leap didn’t come without its stresses and risks, Penner says the ownership of her time and schedule has been life-changing. Penner started Fixe Beauty because she saw a massive need for high-quality training in the beauty industry, more specifically for eyelash extensions. She saw how the currently unregulated beauty industry left the door wide open for people to offer inadequate and unsafe training programs and wanted to provide a fix. Fixe Beauty offers a curriculum that follows the guidelines of the Canadian Accreditation Society and Provincial and National Health Regulations while offering the highest quality and most comprehensive training possible, at a price that is accessible for other female entrepreneurs starting out. Penner says she finds joy in being a part of raising the standards in the beauty industry while also getting to watch her students grow in their trade and their business. FACT: Fixe, which opened in April 2017 currently has educators in Alberta, BC, and Ontario. They also travel nationwide to offer courses in locations that do not offer extensive training programs. Jan Wong Ken, Owner and Operator, Cookie Mama Inc.
Jan Wong Ken’s first “customers” were her daughters. 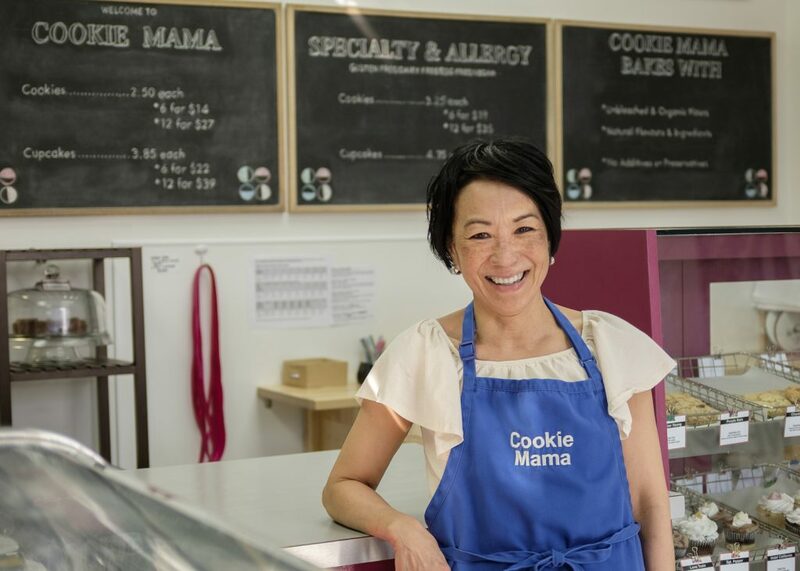 Before taking on the world of corporate gifting with her business, Cookie Mama, Wong Ken’s daughters acted as a focus group, testing her new recipes and providing honest feedback one could only expect from children. As her business took off, she moved Cookie Mama from her house into the commercial kitchen where she continues to hone her skills. Wong Ken and her staff treat decorating their offerings as an art. Each treat is hand-decorated and made in-house. They also take pride in providing delicious allergen-free product lines for Calgarians with a variety of dietary needs that include dairy free, gluten free, and vegan choices. Today, Cookie Mama continues to champion the creation of products without preservatives or additives, while providing the community with stunning, often hilarious, baked goods. FACT: Cookie Mama has a cookie named “Smooth Criminal,” a cupcake called “Super Freak,” and a cheesecake brownie named “No More Drama.” To top it off, one of her recent cakes sports a dabbing unicorn. Ashley Slagter loved doing hair. She loved talking to the amazing people that sat in her chair each day and she loved making them feel beautiful. But working in a busy salon often left Slagter feeling overwhelmed and she had a feeling her clients probably felt that way, too. Slagter often dreamt about working in her own smaller space — a dream she did not know would come to fruition so quickly. 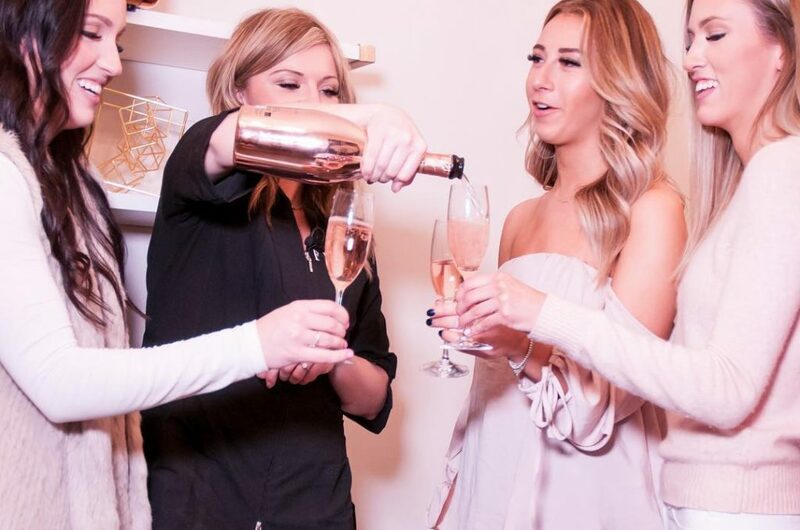 With her business partner, Melissa Lalonde, Slagter secured a space in Citizen Salon Studios, a collective offering privates studios and for stylists and estheticians so they can run their own business without high up-front costs and long-term leases. Together they opened the doors to Nice Salon in February 2018. FACT: You can follow Slagter on Instagram for hair tips, inspiration or even book your own appointment with her!